This TI-EC7 Pro was introduced in 2006 together with the TI-EC3 and TI-EC5 in Europe. It followed the €-1796 and €-2003 introduced already in 1999. It is not easy to follow the decision path why a complete series of Euro-calculators was introduced in 2006. Please remember that on January 1st, 2002 the introduction of the new bank notes and coins took part in EMU (European Monetary Union). 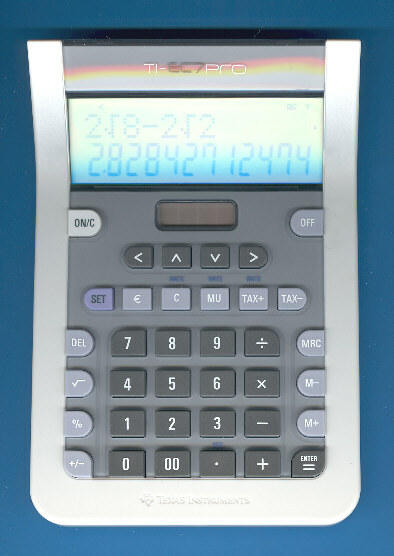 Compared with the traditional basic calculators the EC-7 Pro added a scrollable entry line featuring 12 characters to the display. The upper line permits to recall the last entry and to correct it instantly. We know this feature since 1999 from the scientific calculator TI-30X IIB. Dismantling the TI-EC7 reveals with a single-chip calculator circuit bonded directly to a printed circuit board (PCB) a technology known from the 1990's.